With the amount of hype, resources and development invested within Anthem, Bioware and EA need to make certain that this Big Mech with Cheese combo special is satisfying enough to keep players around not just for days, but months. They are seasonal activities, not one-shot endgame missions. Those anxious about Anthem's endgame, BioWare is doing their best to make sure everyone's fears are quelled by not only releasing a new trailer listing down what players can expect once they reach the end of Anthem's campaign, but now, the studio has even released an early Anthem roadmap! For more on Anthem, be sure to check out a breakdown of what Anthem's Endgame content will look like from a gameplay perspective, as well as 10 minutes of a Legendary Contract on Anthem's challenging Grandmaster I difficulty. 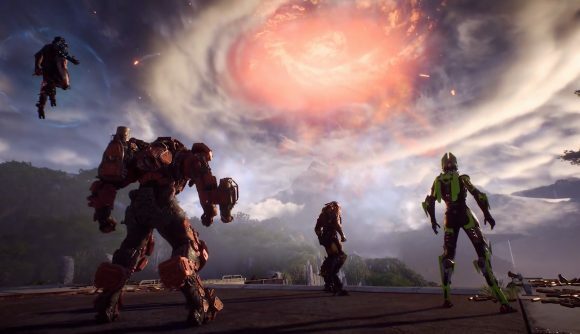 Once you reach Anthem's endgame content, you can grab new gear in a variety of ways. Also central to Anthem's endgame are Cataclysms; limited-time world events which will alter the world and introduce various hazards including powerful creatures and extreme weather. Anthem has six total difficulty levels: Easy, Normal, Hard, Grand Master, Grand Master 2, and Grand Master 3. Different endgame objectives will reward the player with crafting blueprints for gear and personalization items. The video also teases that you can do freeplay in the end-game. Improving your reputation with different groups will give you access to crafting blueprints. These multi-part missions take a lot more work, skill, and firepower to complete, but the rewards are far greater to match.